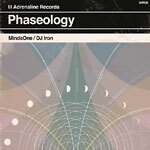 Phaseology is the follow-up to MindsOne's 2014 critically acclaimed release, ''Pillars'', produced by Kev Brown. This time the MindsOne crew teams up with DJ Iron who handles the entire production. Jazzy boom-bap with dope lyrics and plenty of cuts!